For all of his Oscars, William Wyler's career is more interesting than inspiring in that he managed to make some respectable, even masterful films while effacing virtually any trace of an authorial personality from them (unless that personality is of a self-effacing nature, in which case we may be dealing with a coldly Bazinian ideal). Directing from his own adaptation of a stage play which was in turn adapted from Henry James' Washington Square, Wyler is in peak form showcasing his abilities to dramatize material with potent efficiency. He does this chiefly through subtle but expressive deep-focus camerawork (along with Hitchcock he can be said to have pioneered the staircase school of suspense cinematography), and of course by working with A-list acting talent. The Heiress offers a particularly fascinating case study in clashing acting styles -- Olivia de Havilland's hapless spinster-as-demure Hollywood damsel is beset on one side by Ralph Richardson's stern patriarch realized with Shakespearean authority, and on the other side by Montgomery Clift's inscrutable 19th century suitor whose brooding Method mannerims suggest that he stepped out of a via time machine. Whether by design or chance, Wyler benefits from the clash of these styles informing the character conflicts onscreen. The climax and famous ending, while certainly dramatically uncompromising, still feels a bit too pat to this viewer (for the same reasons that I was let down by the ending of Polanski's Repulsion). If anything, by literally shutting out an expressive Method actor's attempts to break into a scene, it offers a visual metaphor to Wyler's hermetically sealed approach to impeccable filmmaking. "To play de Havilland's emotionally distant father Wyler turned to Ralph Richardson, who had done the role in London. 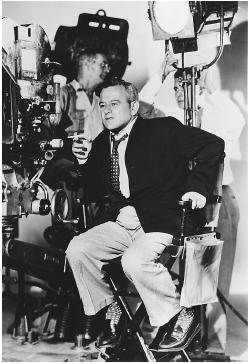 On his first day of shooting, Richardson asked Wyler how he should play a simple scene in which he comes in, hangs up his coat and awakens his sleeping daughter. When Wyler said there didn't seem to be too many different ways of doing it, Richardson astonished him by showing him six subtly different approaches to the moment. His professional poise threatened de Havilland and Clift, however. She felt he was trying to steal scenes from her by doing little bits of business in the background, not realizing that Wyler had instructed cinematographer Leo Tover to keep Richardson's bits outside the camera frame. Clift complained that Richardson never changed what he was doing from take to take, making it harder for him to try different things. At the same time, Clift and de Havilland had their own difficulties. Although she appreciated what he was doing, the actress thought Clift was working almost totally for himself, shutting her out of their scenes together. Yet she had to acknowledge that that helped her performance, since her character felt alienated from the real world and shut out of life. Clift, however, complained that all de Havilland did was learn the lines, then show up and ask Wyler how she should play the part. This, he thought, wasn't real acting. When Wyler started giving him notes in front of the cast, Clift retaliated by staying in his dressing room with his acting coach until it was time to shoot his scenes. De Havilland's faith in Wyler was well placed, however, as she delivered one of her best performances under his guidance. They only had trouble on one scene. When Townsend jilts her, she has to climb the stairs to her bedroom with the suitcase she had packed for their elopement. She did numerous takes that just didn't get the right emotional tone for Wyler. Finally, she got so frustrated that the usually professional de Havilland threw the suitcase at him. At once, he realized the problem. There was nothing in the suitcase. He ordered it filled with heavy props so that her efforts to drag it up the stairs perfectly captured her dejection." "It was Montgomery Cliftâ€™s second film. Red River was the first, as you know. He took his work very seriously, was wonderfully prepared. But he did have a Polish lady with whom he worked out all of his parts, and she was on the set. So that after he had a rehearsal, he would look up to her to see whether she approved or whether she didn't. Not so much fun for Willy Wyler, as you can imagine. And it wasn't too much fun for me. But it kind of helped me. It helped me with Catherine in a way. It could have been very destructive but I made it helpful. And Ralph Richardson wasn't always easy to work with. He had a terrible British trick of flapping his gloves during a scene. I mean, it was a wonderful cast, and he was a marvelous actor, marvelous person. But little naughty things he didâ€”that you're playing an intense scene with him and he will be clapping his gloves like this. I knew from just working with him it was a British theater trick. And I went to Willy and I said, â€œThis is very distracting to me. And it will be very distracting for the audience.â€ And he said, â€œDon't worryâ€”[the gloves will be out of the frame].â€ I was able to play the scene, even though it was a distraction to me. But that's all right too.
. As for Wyler, I thought, 'It doesn't matter. I know that you are a perfectionist. And you want the very, very best and I don't care how you get it as long as you get it. And I'll make 100 takes, you'll choose the second one, I'll make 100, but I don't care, you're trying to get the best. And that's what I want too.'" For the film The Heiress, we used setting motifs. The staircase took on a central role in the story, as did the grill work and winter garden outside. The central character was a girl who felt trapped by a father who thought that she was not as sophisticated as his dead wife, who used to play the piano and make their house beautiful and so forth. So, I tried to set the daughter as if she were in a birdcage. She was caught. The winter garden became a pictorial motif that lent a feeling of claustrophobia. She was framed in the grillwork of this Victorian building like a caged bird, and downstairs her lover would come. The final design element was to characterize the girl's lover as a kind of adventurer, who was really only out for money. The question of the story became, is it better to be unhappy under the rule of a heartless father or would the girl be happier with a worthless husband, who was at least a handsome man and a lover? So, the architectural element of the staircase became a very important prop. When the girl was happy, she ran down it and it had a kind of joyousness and beauty. When she was rejected and had to climb back up, it was an object of torture. This William Wyler production is very likely the best film adaptation of Henry James, with the possible exception of THE INNOCENTS. The screenplay, by Ruth and Augustus Goetz, is based on their stage version of James's Washington Square, and at first the period settings and clothes may make the movie seem a little heavy and stagey, but then Wyler's mastery of the psychological nuances can have you drawing deep breaths. It's a peerless, super-controlled movie, in the same mode as Wyler's 1952 CARRIE, though more fully sustained. Wyler's greatness here is that he can hold the elements of the film in his palm without constricting the actors. He frees them. Montgomery Clift is just about perfect as James's fortune hunter Morris Townsend and Olivia De Havilland does her finest work ever as the heiress Catherine Sloper. DVDReview.com review of the Universal DVD praises the film but laments the lack of extras. William Wyler's page on They Shoot Pictures, Don't They?